Hi! I'm Jolie Jennings, librarian at Bill Burden Elementary in Liberty Hill. I've been using Flipgrid for a year, and I absolutely love it! It is one of my favorite tools to use with kindergarten and 1st grade students because it gives the opportunity to easily share with others without writing or navigating a complicated app. I have also used it as a virtual book club for students who couldn't come to a before or after school book club meeting. Here are some of the things we've done here at Bill Burden Elementary using Flipgrid. If you have questions or need more information, feel free to go to the About Mrs. Jennings page for contact information or find me on Twitter @joliejennings. After reading A Turkey for Thanksgiving and A Grateful Thanksgiving, students used Flipgrid to share what they are thankful for. For career week, students share the career they would like to have after reading When I Grow Up and Whose Hands Are Those? For National Poetry Month in April, students share book spine poetry. Use the titles on the spines of the books to create a poem. See the video for an example. Flipgrid is a great platform for book clubs! Students can respond as they read, or you can post questions for a more structured book club. Check out the Disco Library topic for details. This year, I'm super excited to try GridPals with my classes. 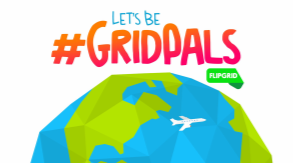 GridPals gives students an opportunity to connect with other students all over the country. We are in Texas, and we have a list of recommended books each year called the Bluebonnet List for 3rd-6th graders. I want to connect with another Texas school so my 3rd and 4th grade students can discuss the Bluebonnet books with a wider audience. You can go here for more information on GridPals. The Global Read Aloud is an amazing program that connect students from all over the world using books. There are books chosen for various age levels, but I use the GRA with 1st and 2nd graders. We read a different picture book each week for six weeks and our partner class reads the same books. Flipgrid gives students who may not be able to write the ability to communicate with other students. I would love to connect with you this year on Flipgrid! The Flipgrid website is a treasure trove of Flipgrid tip and tricks! The webinars (found here) are incredibly helpful and feature teachers and Flipgrid experts sharing their knowledge. Now that all Flipgrid features are free for everyone, the resources are that are available are super helpful! I look forward to connecting with you on #GridPals, #GridGuides, and on Twitter!